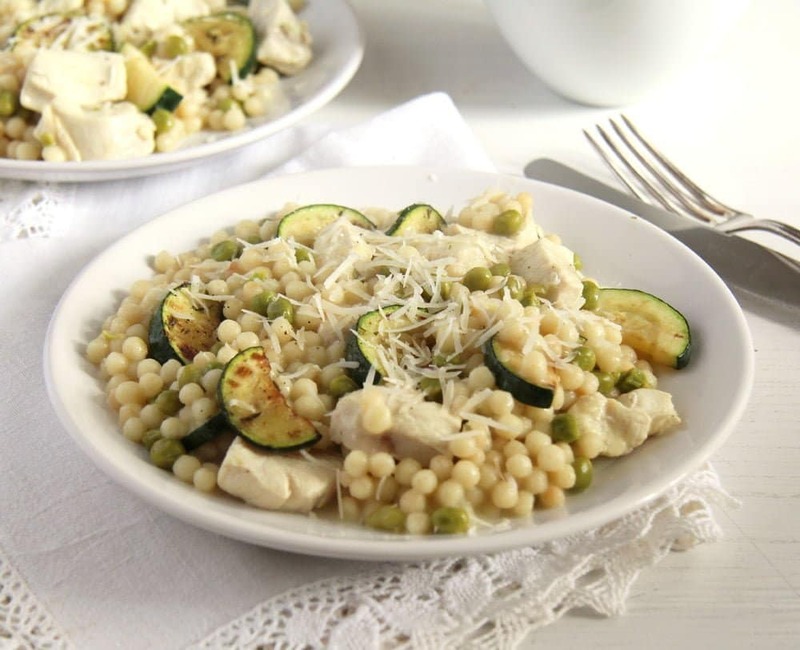 A one-pot dish with chewy Israeli couscous, tender chicken breast, sweet peas and crunchy zucchini, and easy and delightful summer dish. I bought this bag of Israeli couscous a long time ago, cannot even remember when exactly. I put it in the pantry and kind of forgot about it, unfortunately. Recently I thoroughly cleaned and organized my pantry, threw away some forgotten and expired things (I hate when that happens) and placed some “soon to expire” things on the most reachable shelf, so that I don’t forget them again. Among several kinds of lentils and beans (we had lots of bean/lentil soups/stews/spreads lately), there was this rather large bag of Israeli couscous. I had to search the internet for some recipes, I’ve never cooked with it before, so I wasn’t very sure what to do with it. 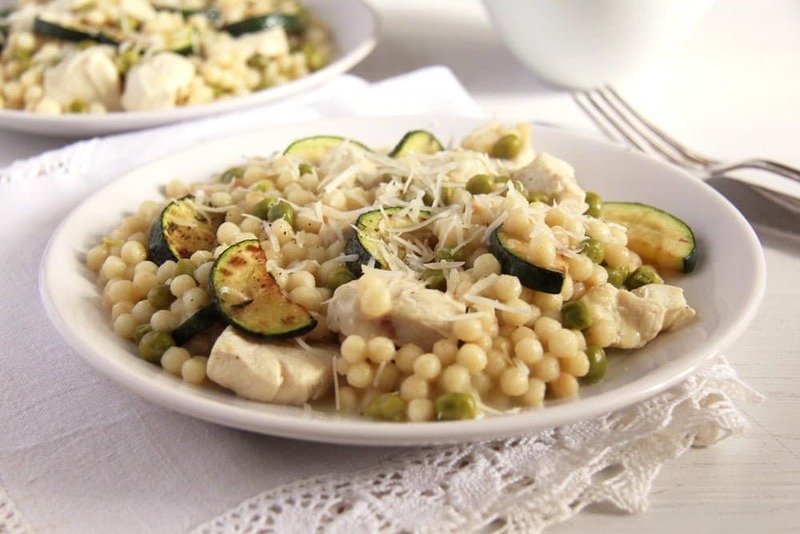 I found several recipes similar to the one I eventually cooked, from these 5 or 6 different ones, I have made my own version of an Israeli couscous with chicken, zucchini and peas. I loved it! And I wasn’t the only one, definitely something for the children as well, they loved the round pasta shapes and the tender chicken breast pieces. And I loved the zucchini as well. I preferred to fry the zucchini pieces first instead of cooking them together with the rest of the ingredients. This way they retain their bite instead of becoming too soft and mushy. Just stir them gently into the finished dish and enjoy. 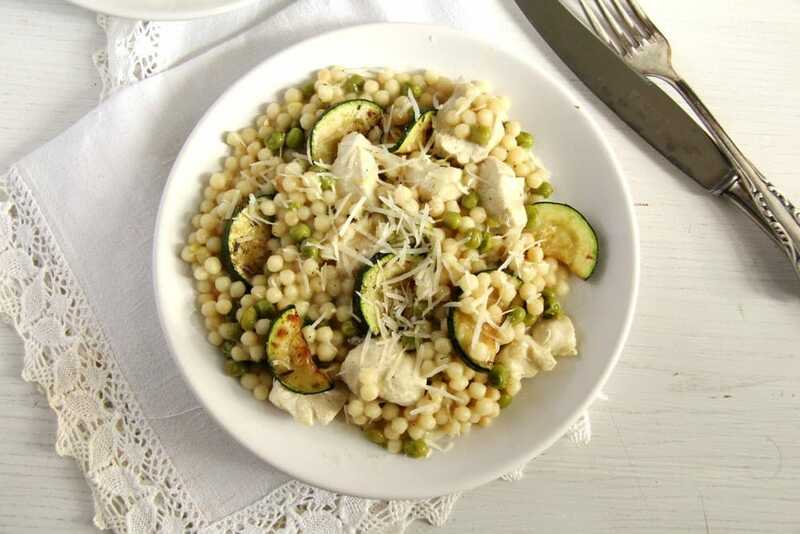 In case you don’t know (I didn’t really until recently), Israeli or pearl couscous is pasta in form of little balls, apparently developed in Israel in the 1950s when rice was scarce. It is made of wheat, which is shaped into balls and then toasted. Due to its size, it remains quite chewy even after cooking and I have to say, that is what I like most about it. It is not gluten free but otherwise vegan, full of fibers and has a low glycemic index, so a quite healthy food I would say. 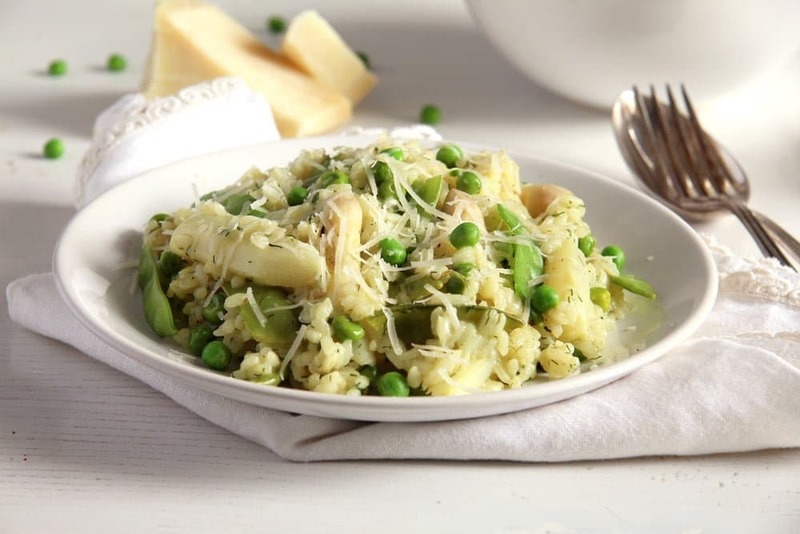 You can use it like you would use pasta or rice or regular couscous, it is versatile, can be eaten as a side dish, in salads with lots of veggies (tried that too with roasted vegetables, it was delicious) or in one-pot dishes like this one. If you don’t know it yet (most of you probably do, I think I am quite late to discover it), give it a try, I think you would like it! Heat 1 tablespoon olive oil in a large skillet. Half the zucchini lengthwise and chop the halves into pieces. Fry the zucchini until golden but still crunchy, take out of the skillet and set aside. 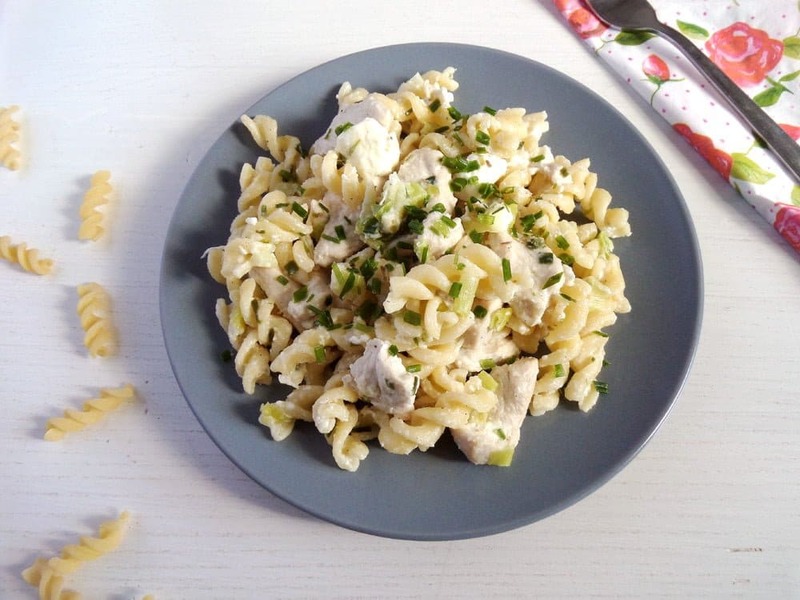 While the zucchini cooks, chop the chicken into bite-sized pieces. Heat the second tablespoon of olive oil in the same skillet. Add the Israeli couscous and toast the grains, stirring, for one or two minutes, until lightly browned. Add the chicken stock, chicken pieces, lemon zest and juice and frozen peas. Bring to a simmer and cook on a medium-low heat for about 10 – 13 minutes, until the couscous and the chicken are cooked through. Carefully stir in the zucchini and heat everything for another 2-3 minutes. Adjust the taste with salt and pepper and stir in the Parmesan. Serve immediately with more grated Parmesan and a green, crunchy salad with radishes. A simple yet very delicious and satisfying dish. Thanks for sharing, Adina. I love Israeli couscous and everything else you have in here. 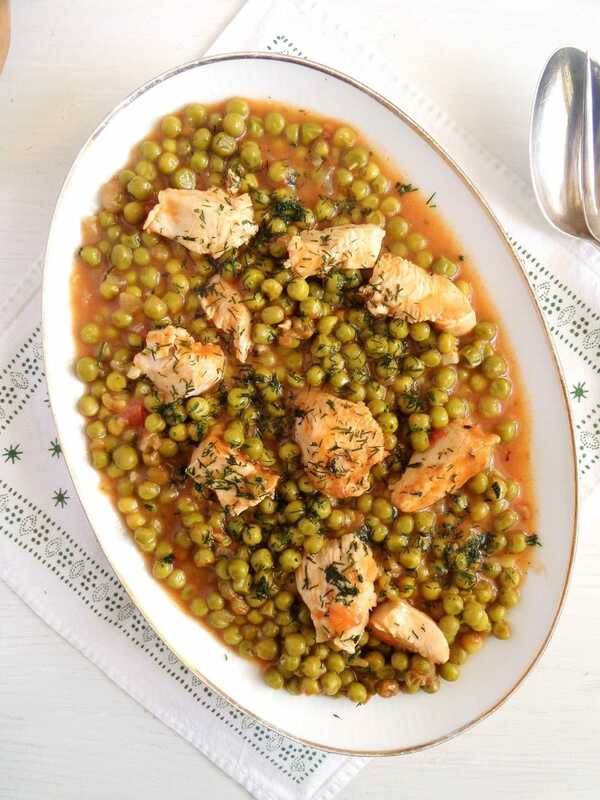 It sounds wonderful and yes, a perfect dish dish for children too! Your recipes always intrigue me and this one is no exception, Adina. 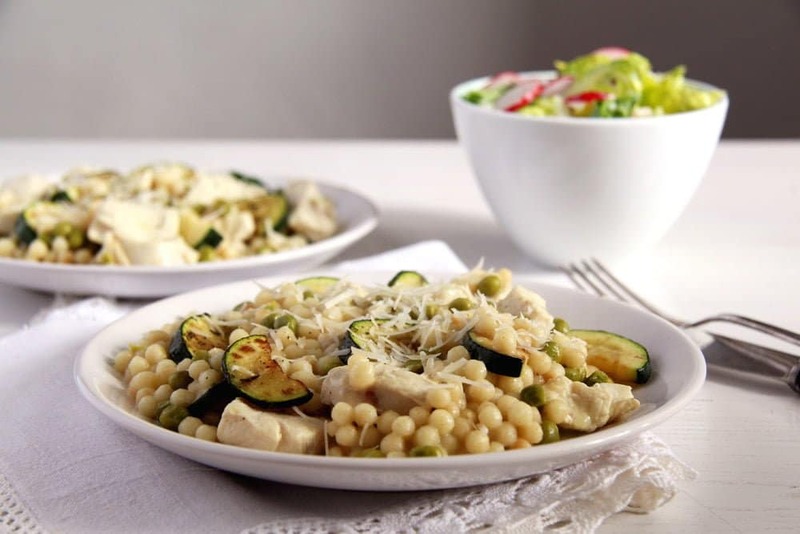 I love couscous but have yet to try this zucchini and chicken. Such a comfy and satisfying meal. I think cleaning out and organizing my pantry has been on my list of things to do forever! And I have made the regular small Couscous, but never Israeli Coucous. I really want to give this a try! And loving another zucchini recipe, I can’t get enough of it in the summer! Pinning! 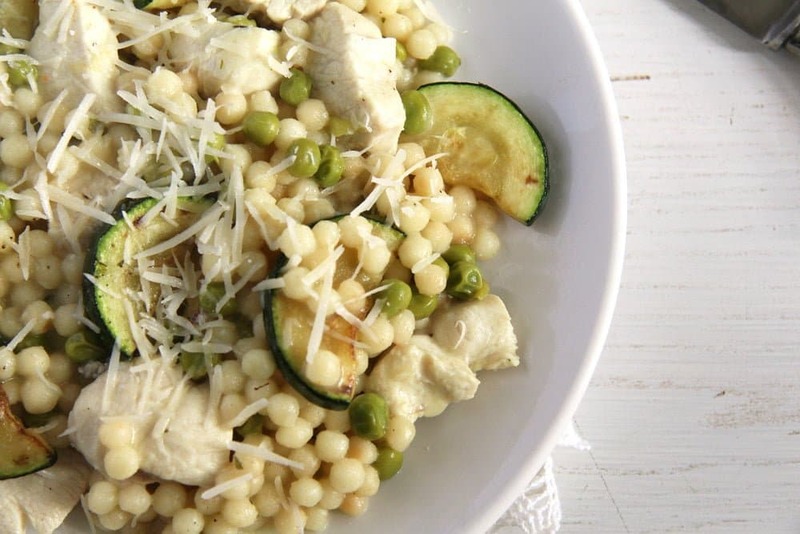 Such a great way to use all of the summer zucchini that is about to come pouring our way! Pinning! Geez…you are such a great cook Adina! !